Image size: 17 1/2" x 27"
The CH-47 Chinook has proven time and time again, to be an indispensable tool of mobility for the US Army. It is a powerful helicopter, capable of great speed and surprising agility, and one of it's capabilities is water operations. The Chinook can not only take off and land in water, but also, it actually floats. 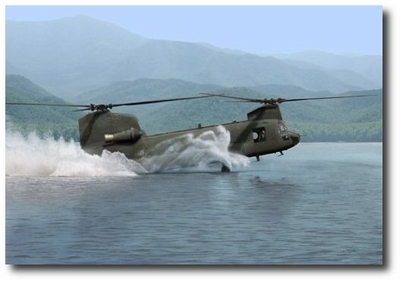 In "Water Ops," by artist Dru Blair, the Chinook is depicted skimming across a lake at high speed during an insertion. The tremendous forces at work are evident by the spray careening vertically and forward off the front gear. 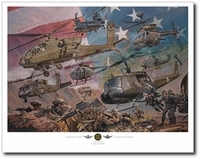 "Water Ops" is carefully reproduced on Museum quality Archival Stock, each print is individually signed, numbered and inspected by the artist for color consistency and accuracy. A limited number of 100 artist proofs is also available.